It's challenging to build contemporary buildings that mesh with a given vernacular, and even more so to do it in a way that minimizes site disturbance. 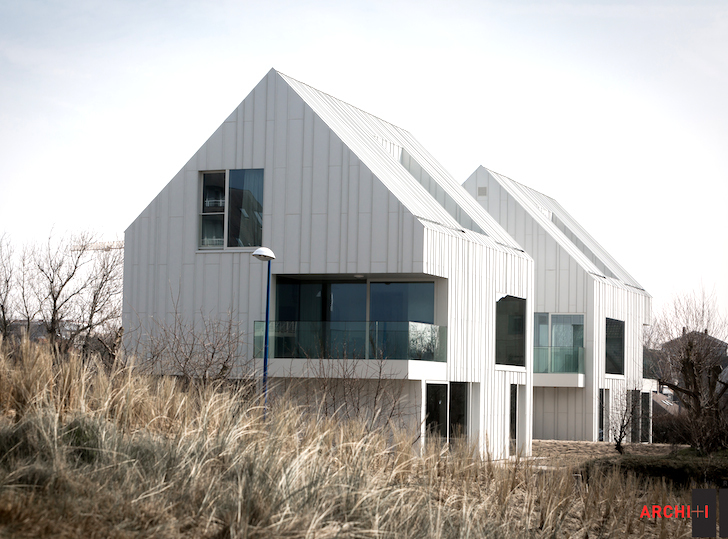 Yet BURO II & ARCHI+I have achieved both with their Blanco Oostduinkerke Residence in Belgium. Located near the border with France in Koksijde, these twin duplexes are comprised of two apartments. Each are clad in white aluminum sheets, a detail that blends well with the surrounding coastal architecture, and conceal 10 parking spaces under the dune grasses. 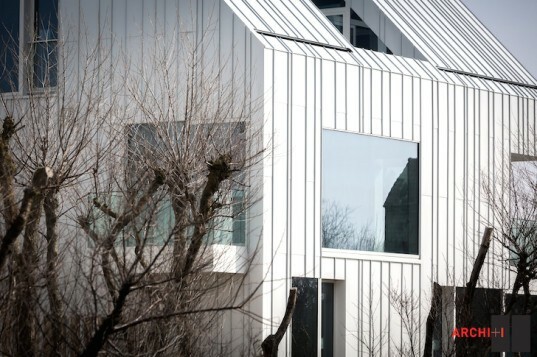 The three-storey duplexes have been specifically designed to merge with the adjacent residential center and the landscape, according to the designers. The ground floors are reserved for three bedroom apartments, while the upper floors are comprised of European styled maisonettes that lead to an attic via a spiral staircase. Window openings in the aluminum facade ensure plenty of natural light, while vertical cutouts in the roof extend the interior living space outdoors with terraces. “A uniform design was adopted for the façade and the roof to achieve a striking and distinctive architectural style. The preferred choice was white aluminium, as a contemporary application and interpretation of the white coastal architecture,” the architects write in their design brief. And while they don’t say it, material uniformity reduces construction waste as well. “Due to its scale, purity and simplicity in terms of volume, façade composition, details and use of materials, the buildings blend effortlessly into their surroundings,” BURO II & ARCHI+I adds. The space between the two duplexes and the area surrounding them have been planted with dune grasses that conceal the parking spaces below and further maintain the integrity of the existing landscape. The Blanco Oostduinkerke Residence is an excellent example of how good design can minimize the built environment’s footprint without compromising style. This beautiful black and white photograph by Thomas de Bruyne, who is responsible for all of the photography, gives the twin complexes a unique sense of drama.